Weddings are full of so many visual elements, the dresses, the rings, the decor, the venue, the lighting, the scenery and most important, all the people that are attending or are part of the ceremony. As a videographer, I can film all day at a wedding and there will almost constantly be something going on or something available that I can film. Its really easy to get caught up in all the visual details, that sometimes the sounds can be overlooked. One of the best and most important elements of a good wedding video is the audio. After all, one of the biggest highlights of the day is when you say your vows to each other and are pronounced husband and wife. The foundation of the soundtrack for our videos is the sound that is recorded live at the wedding. We can use the audio from the ceremony, the speeches, and candid moments to bring the video to life. None of this is possible, of course, if the audio that we record is poor quality, or full of background noise. This high quality audio is one of the main things that sets apart a professional wedding video from a recording on a smartphone or consumer level camera. For professional level audio recording we utilize small microphones placed on the officiant of the ceremony as well as the groom and anyone else that will be speaking. These microphones enable us to record crisp and clear sound that will be free from most the background noise that would be picked up from microphones located on the cameras (or even on a phone in the front row). 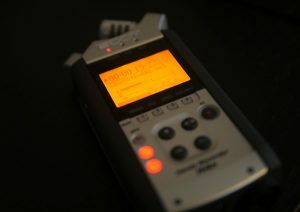 During the reception we tie a professional recorder into the audio system to record audio directly from the microphones used for speeches, announcements or other events. These techniques give us the clear audio we need to use it effectively during the editing process. Your wedding video is one the few items you can take with you to remember your wedding day. The photos can capture all the visual elements of the day, but the video can bring the day back to life and let you see and hear the highlights of the day again anytime.